If you’re a liturgy geek like me, you have already read the introduction for today’s worship on the front page of your bulletin. And you already noticed that today is the first of five weeks in which we will spend time in the sixth chapter of the gospel of Saint John. And most of those weeks will have a bread theme. Today’s gospel is about bread, Jesus feeding a few people in the middle of nowhere, and later in the story, Jesus walking on water. As I’ve studied these two stories and thought about how God is speaking through them today, I was struck by something new this time. Which is good, because to be honest, I grow weary of talking about bread every three years when these readings come around in our worship. That something new is this time control. Or rather, who’s actually in control. 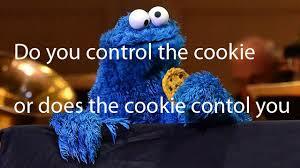 So often in my life, I’ve thought that I was in control. Anyone else feel that way. Believe that you are in control?? My social media feeds, email inbox, and countless other times each day are full of suggestions for how I can regain control of my life, my job, my rest, my marriage, my happiness. Take control of you the advertisements tell me. If I’m experiencing success, it’s because I’ve controlled things in such a way as to bring about that success. I’m in charge of all that is mine. And…often times…to be honest…I think I’m pretty darn good at being in control of the greatness that I am. I don’t know, maybe some of you can relate to that. We think we have everything figured out and the things that are happening in our life are happening because we have controlled their happening in the first place. And then all of a sudden, the winds of life start to blow a little harder and rock the boat a little more. In ways that we hadn’t anticipated or planned for or saved for. We begin to be overtaken by waves of an unexpected change or an unforeseen medical diagnosis. And in those times we question ourselves and wonder if we are still in control? Can I save myself when life seems to be spiraling out of control? Was I really ever in control of anything to begin with? Here’s the reality of life in this world and in this body. It’s also why Jesus is so important along this journey. You and I can’t avoid storms. They come to every one of us – the good and the evil, the rich and the poor, the compassionate and the judgmental, even the republicans AND the democrats. God doesn’t promise, and following Jesus doesn’t eliminate, challenging storms from happening in our life. What God does promise, and what following Jesus does give us, is someone to walk with us during all of life’s hills and valleys and storms. That’s the good news you and I are being invited to receive in our two stories from the gospel of John today. We are not the ones in control. Jesus is. Jesus has always been. And will always be the only one who actually is in control. 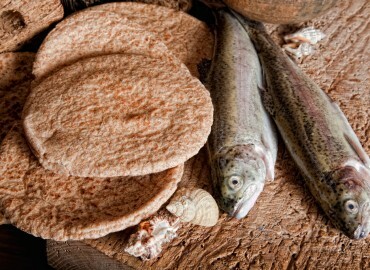 Maybe that’s why the miracle story of the feeding of the 5,000 is the only miracle story found in all four gospels. It’s that important for us to receive. And maybe that’s why Jesus walking on the water and calming the storm is appropriately connected to the feeding of the 5,000. And maybe that’s why the math equation that is the title of today’s sermon makes sense. 5 + 2 x 1 = 12. That makes perfect sense, doesn’t it? 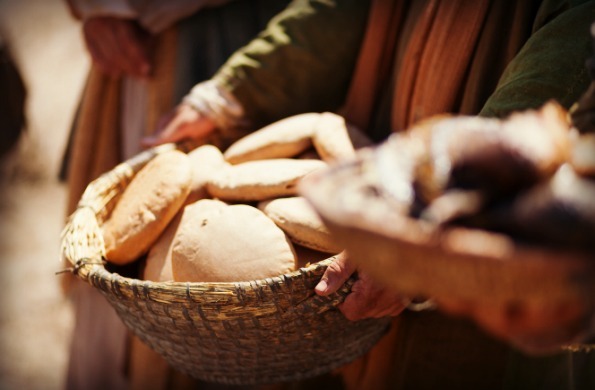 5 loaves of bread, plus 2 fish, multiplied by Jesus – the one who is actually in control, equals 12 baskets of leftovers after everyone has had more than their fill. So let’s back up a little. In the first story of today’s gospel reading, Phillip is faced with an unsolvable problem that he can’t control, even though he thinks he can. Seeing the large crowd pressing in, Jesus asks him, “Where are we to buy bread for these people to eat?” Phillip, still wanting to control the situation, thinks Jesus may have finally lost his mind. They are sitting on a hillside after all, far away from a town that can sell them bread, and are nearing the point of having a riot of hungry people on their hands. Phillip’s attempt to control the situation fails because he only thinks about what they don’t have – they don’t have enough money to buy enough bread; rather than what they do have – Jesus, the savior of the world standing right beside them. Giving thanks for what they do have. Throughout this story, who is actually in control here? Not Phillip. Not Andrew. Not the hungry crowd. Not the little boy with the lunch his mom had packed for him before he left home that day. Jesus is in the middle of all of this. Jesus gives thanks for all that God has provided. All are fed. And if we go back to the second story for a second. Jesus is there too. And tells the disciples in the boat, and you and me today, do not be afraid. All storms are calmed. The key piece of the story the disciples find themselves in – whether it’s along a hillside or in a boat or any other location that we encounter them in the gospels…is Jesus. Jesus, who is always in control, even when the disciples least expect him to be. Even when they thought they had everything under control. When we finally begin to open ourselves to Jesus being in control, miracles and wonders and other things happen that are far greater than anything we can experience by ourselves or imagine on our own. The words of our Benediction today will wash over us with blessing and send us into the world to live as followers of Jesus this week. Followers of Jesus who live believing that Jesus is with us always and has everything under control. And if you’re a liturgy geek like me, you’ll notice that the words of today’s Benediction echo the ancient words from the Apostle Paul to the church in Ephesus and the church in Bismarck today. Brothers and sisters in Christ, for those of us who claim to follow this Christ Jesus, the equation 5 + 2 x 1 = 12 makes complete and perfect sense. And walking on water is just a simple part of the way our Savior calms life’s unforeseen storms. Jesus has got it covered. 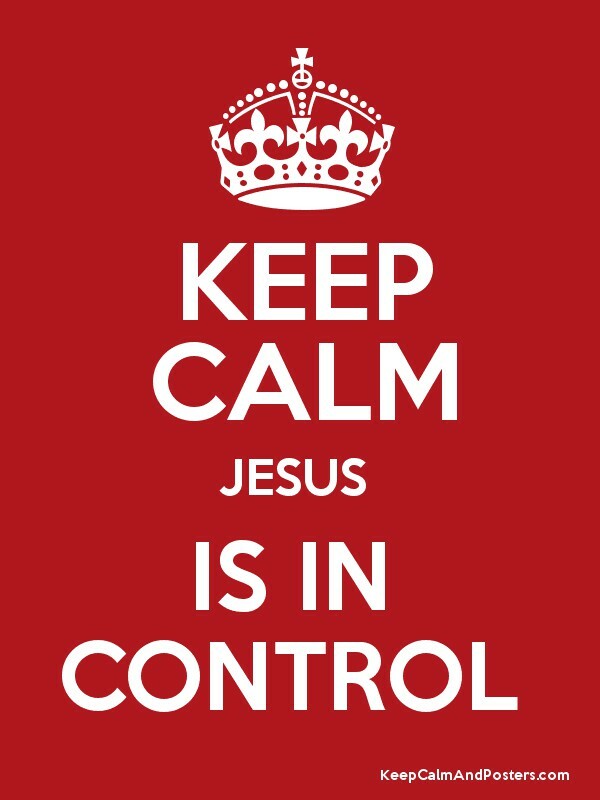 Jesus is in control. Thanks be to God that he is. Amen. This entry was posted on Thursday, August 2nd, 2018 at 5:02 pm	and posted in Recent Sermons. You can follow any responses to this entry through the RSS 2.0 feed.